Aaron Finch has shown his intention in this series. 172 of 76 balls, this is how he destroyed Zimbabwe bowlers. In Today’s Dream11 Fantasy Cricket Match Prediction of AUS vs PAK 5th T20, we will cover Toss Prediction, Pitch Report of Harare Sports Club, Harare, Fantasy Cricket News, Probable Playing 11 and Who Will Win. Who Will Win the 5th T20I Match, Between AUS vs PAK and Toss Prediction? Where Can You Watch the Live Streaming of PAK vs AUS, 5th T20I or Channels to Watch? What is the best combination of players for Dream11 and Fantasy Leagues for 5th T20 Match? Australia has won two matches back to back and Pakistan has won two matches out of three in this series. Aaron Finch is in prime form and shown his intention. Even AUS bowlers are also performing. According to our astrology prediction, AUS will win today. The team winning the toss should opt to bowl first as the pitch will assist the seamers initially. If you look at the previous four matches, the team winning the toss has opted to bowl first. According to our astrology prediction, PAK will win the toss and ask AUS to bat first. Date: The match will be played on 5th July 2018 (Thursday). 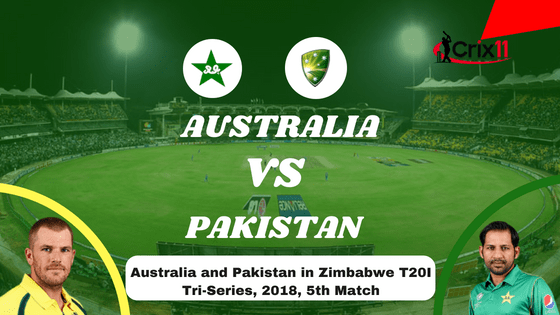 Match: Australia and Pakistan in Zimbabwe T20I Tri-Series, 2018, Pak vs Aus, 5th Match. Venue: Harare, Harare Sports Club. Time: 08:00 AM GMT, 01:30 PM IST, 10:00 AM Local. The Pitch of Harare, Harare Sports Club is good wicket to bat on. It will be a batting-friendly pitch, although the wicket will help the seamers in the initial couple of overs. The batsman can score big if they manage to handle the movement in the first couple of overs. Overall, the pitch will be a batting paradise. Note: If you know how the pitch will play, then you can select your team according to the pitch. Make use of the pitch while selecting your team for fantasy leagues. From the above pitch report, you would have understood that keeping batsmen in your team would be a wise choice. The weather is expected to be sunny in the morning and partly cloudy in the latter half of the day. The cricket fans and fantasy users can watch the complete game as there is no sign of rain. The temperature is expected to be 15-Degree Celsius and the humidity to be 59%, which may go up to 73%. The average first inning score of this ground is 156. Highest total on this ground is 229/2 in 20 overs by AUS vs ZIM. Lowest total on this ground is 108/10 in 17.5 overs by ZIM vs PAK. If you look at the last five matches, PAK has won two matches out of five matches whereas AUS has won three games out of five games. Aus has won last three games back to back against Pak. In overall encounters, both the teams have won seven games each. AUS has won 47% of the matches and PAK has also won 47% of the matches. Australia, Pakistan, Zimbabwe T20 Tri-Series 2018, will be broadcasted on Sony Six and Sony Six HD in India and its Subcontinent Countries like Afghanistan, Bhutan, Bangladesh, Sri Lanka, Nepal, Maldives, and Pakistan. Sony Six & Sony Six HD has all the exclusive rights. You can also watch the live streaming on SonyLiv Digital Platform (App and Website). All the departments of Australia Team have performed. Why fix if nothing is broken. Aaron Finch will play with the same playing 11 until and unless there is any serious fitness issue. Travis Head, Aaron Finch (captain), Nic Maddinson, Billy Stanlake, D’Arcy Short, Ashton Agar, Glenn Maxwell, Jhye Richardson, Marcus Stoinis, Andrew Tye, Alex Carey. Travis Head, Kane Richardson, Aaron Finch(c), Billy Stanlake, D’Arcy Short, Mitchell Swepson, Nic Maddinson, Ashton Agar, Jack Wildermuth, Glenn Maxwell, Alex Carey(w), Jhye Richardson, Marcus Stoinis, Andrew Tye. Mohammad Amir has been included in the playing 11 and he has played the last game. Amir failed to leave his impact but he is most likely to play today. PAK won’t try to experiment with a team like Australia. PAK is most likely to play with the same playing 11. Faheem Ashraf, Fakhar Zaman, Hasan Ali, Haris Sohail, Mohammad Amir, Shoaib Malik, Hussain Talat, Asif Ali, Sarfraz Ahmed (captain and wk), Mohammad Nawaz, Shadab Khan. Sarfraz Ahmed(w/c), Sahibzada Farhan, Mohammad Amir, Fakhar Zaman, Usman Khan, Haris Sohail, Shadab Khan, Shaheen Afridi, Hussain Talat, Mohammad Nawaz, Shoaib Malik, Mohammad Hafeez, Asif Ali, Hasan Ali, Faheem Ashraf. Fantasy Cricket Expert Tips: Both the players are good. You can take Sarfraz Ahmed on your team as he will get a good number of balls to play. 83.07% of the Dream11 Fantasy Cricket users have selected Sarfraz Ahmed in their teams and 16.93% of the users have selected Alex Carey in their Dream teams. Make a combination of the above players for multiple teams. Fantasy Cricket Pro Tips: The above all-rounders are most likely to contribute the most. Make a combination of the above players for multiple teams. Fantasy Cricket Expert Tips: the above players are most likely to take wickets today. Make a combination of the above players for multiple teams. Fantasy Cricket Pro Tips: The above players have performed in the previous matches. You can take them as a captain and vice-captain. Aaron Finch, Andrew Tye, Billy Stanlake, Fakhar Zaman and Hussain Talat are the players you cannot avoid. Try to keep top order batsmen from Australia Team and top performing batsmen from Pakistan. Try to take seamers in your team as the pitch may assist the seamers initially. Conclusion: This is it for Today’s Dream11 Fantasy Cricket Match Prediction of AUS vs PAK, 5th T20I Match, which will be played on Thursday 5th July. We have covered all the details required to win any fantasy leagues. We have covered players recent and past performance, dream11 guru and crictom prediction, all the latest news and updates of Australia Team and Pakistan Team, weather report of Harare, dream 11 best teams, keys players, the best choice for captain and vice-captain, where to watch the live match of PAK vs AUS, 5th T20 Match and the details of live streaming of Australia and Pakistan in Zimbabwe T20I Tri-Series, 2018.